Standing on the hills of Rawabi just north of Ramallah on the West Bank, at the moment there's little more than a stunning view. On a clear day you can see as far as Tel Aviv and the Mediterranean. 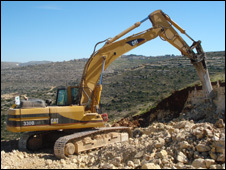 But the bulldozers are here and building is now under way in what will be the biggest construction project in modern Palestinian history. Rawabi, which actually means "hills" in Arabic, will be the first purpose-built Palestinian city. The developers say it will eventually house more than 40,000 people, and will take more than five years to build. It's costing more than US$700m (£458m) most of which has been invested by the Qatari government. Most major housing construction in the occupied West Bank tends to be building in Israeli settlements. These are illegal under international law, although Israel disputes this. From Rawabi itself you can see several Jewish settlements perched on the surrounding hills. 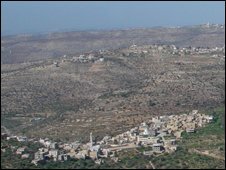 Some have called Rawabi the first "Palestinian settlement". Indeed when you look at the developer's slick promotional video with computer-generated images of the eventual city, it does actually look very much like a classic Jewish settlement, with neat rows of white houses spiralling round a hilltop. Some Palestinians have criticised the Rawabi project for accepting a donation of trees from an Israeli organisation. Rawabi is very much being pitched at a certain type of Palestinian. The promotional video, with the slogan "Rawabi: a place to live, work and grow", shows idyllic-looking young families, picnicking on sun-kissed hills. "This project is kind of like a dream for me," says Omar al-Assouli, who is planning to buy one of the houses at Rawabi when it's finished. He acknowledges he's pretty much the ideal client for Rawabi: young, professional, just married and planning a family. "It will be clean with fresh air, with parks and places for children to play and properly planned in advance." 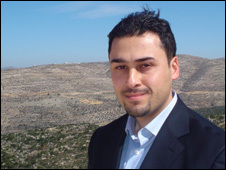 Mr Assouli lives in the nearby city of Ramallah at the moment, but finds it too crowded and busy. Rawabi is very much being marketed as a green, eco-friendly city, although the developers admit some of the green ideas for the city have had to be scaled back because of cost. "We have not been able to get a good standard of living because of the Israeli occupation. Projects like this mean we will able to match them," says Mr Assouli. He says there is a real shortage of quality housing on the West Bank. Hundreds of thousands of West Bank Palestinians still live in UN-run refugee camps. They were forced to move there after the first Arab-Israeli war in 1948 following the establishment of the state of Israel. These camps are not tents, but sprawling urban neighbourhoods often with poor housing, roads and amenities. There is also a shortage of land. Under the the Oslo Peace Accords signed in 1994, Israel has full control of about 60% of the occupied West Bank. Palestinians have full control and building rights in only a small proportion of the territory, about 17% of the total. The Oslo accords were only meant to be temporary, but their provisions have lasted 16 years. And therein lies a big problem with the Rawabi proposals. The Palestinians control the land on which Rawabi will be built, but not the area through which its access road will have to go. Israel has yet to grant permission for the road, which will be essential for the project to succeed. At the moment, the only way to access the site is via a narrow and bumpy back road. However, the developers got fed up of waiting for Israeli permission for the new road and started building the city anyway. "Is it hasty? Well perhaps it is," says Bashar Masri, chairman of Massar, the developers of Rawabi. "But maybe it is our only way of nicely saying to Israel that we are ready, we've been planning, we've invested, we took the risk. We're starting construction. What's next? Give us the road and let us move on." Mr Masri admits though that if permission for the road is not given, Rawabi will fail. For the moment, a spokesman for the Israeli government would only say it supports Rawabi and "is working for the project to succeed". 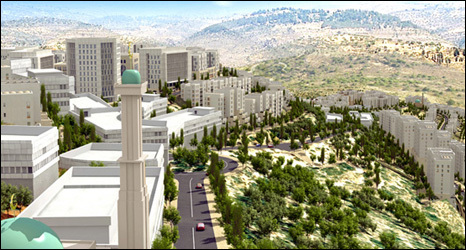 Rawabi could be a huge deal for the Palestinian economy, creating thousands of jobs in the construction process alone. 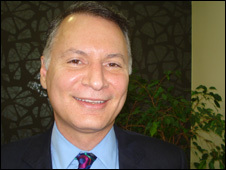 Mr Masri says the very fact it is happening represents a growing sense of confidence in the Palestinian economy. The International Monetary Fund says the West Bank economy showed 7% growth last year. It's important to note though that this was from a very low starting point. Unemployment is still about 20%. Poverty levels are high, and according to the World Bank 30% of the West Bank's economy is based on foreign aid from international donors. Which brings up the issue of cost. Will people be able to afford to buy houses at Rawabi? Mr Assouli says he hopes to pay about $80,000 for his new house. The developers say they will be promoting US style "affordable mortgages", where people with lower incomes are still entitled to borrow. But some Palestinians who have witnessed the recent housing crisis in the United States stemming from so-called "cheap mortgages" might be wary. Rawabi will take years to complete. So what about the prospect that the relatively stable current situation on the West Bank could very quickly deteriorate? "That is the reality in this region," says Masri, "but if we spent all our time worrying about that, we'd never get anything done."